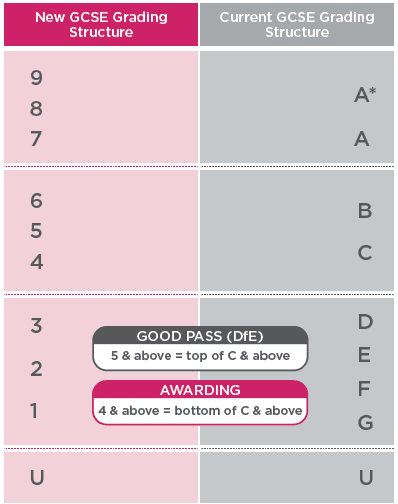 The traditional A* – G grading system for English and Maths GCSEs has changed, but don’t worry if it is confusing. Our ‘grades explained’ graphic below illustrates how the old and new systems compare. There are nine grades in the new system whereas previously there were eight, A* to G. In the new system, 9 is the highest grade that a student can achieve, 1 the lowest. The highest grades of A* and A have been replaced by 7, 8 and 9. Grades B and C have also been replaced by three numbers, 4, 5 and 6. A grade C pass, recognised for many employment and higher education opportunities, will be a 5. However, a 5 is not exactly the same as a C; it is equivalent to a high C or lower grade B. Students who have not achieved a grade 4 in maths and English will need to retake these exams as part of their post-16 study programme at college. * Please note there will still be a small number of subjects that will be graded under the previous system for GCSEs completed in the summer of 2019.